Marie Kondo, the queen of decluttering suggests opening all windows, in the morning, to clear ‘chi‘, a stagnant energy that has accumulated overnight. Another of her tips is: “If you’re ever unsure of what to do, choose the thing or action that sparks joy.”. Every evening, Marie Kondo uses a kind of transferring positive energy activity, which in Japan is called “te-ate” (literally, “to apply hands”) where she takes each item of her clothing in her hands and folds it neatly like origami. Marie doesn’t have a TV and has a few interests outside tidying. Most advice Marie Kondo give is quite good except this one: to limit the number of books you own to 30, which she says it’s her preference. That’s nonsense. Research suggests that books displayed in your home are good for you – the more the better. Also, there is a Japanese concept of tsundoku which means ‘too many books to read or reading pile or letting reading materials pile up without reading them’. If you feel that you’re overwhelmed by the pile of books you have to read – learn speed reading. The danshari minimalist lifestyle of ‘less is more’ has many advocates from Buddhist or zen monks to Steve Jobs (who only wore black polo necks, jeans and trainers) to shopaholics. Bookshops in Japan have a special section dedicated to danshari. It’s interesting that this trend is coming from Japan which is renowned for its consumerism. It’s yin and yang of things. 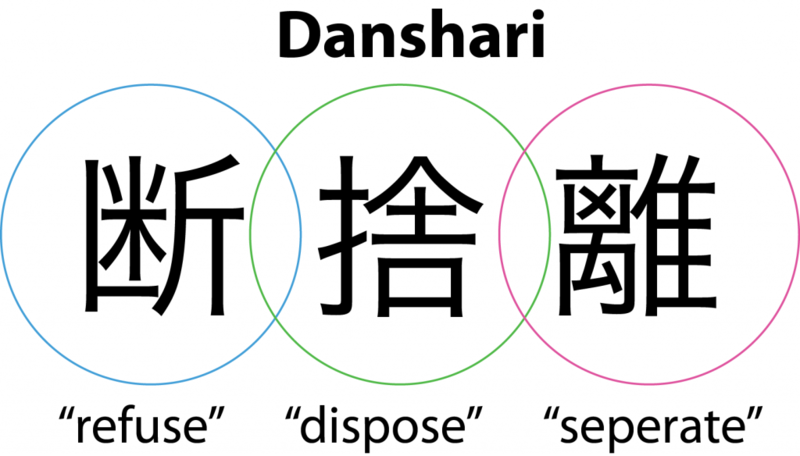 Danshari is similar to another Japanese concept of wabi. Wabi’s definition comes from a Zen master, Daisetsu T. Suzuki (1871-1966) who said “Wabi is to be satisfied with a little hut, a room of two or three tatami mats . . . and with a dish of vegetables picked in the neighbouring fields, and perhaps to be listening to the pattering of a gentle spring rainfall. . . .” (find out more about wabi-sabi and forest bathing shinrin-yoku). 1) Commit to your new minimalist lifestyle. 2) Don’t focus on what you’re losing – focus on what you will gain – i.e. space, freedom and energy. The goal of danshari is not to have fewer things – the goal is to be happy with yourself (as opposed to owning things). 3) Start getting rid of things that you don’t need. Start with the obvious junk such as broken things or clothes that you haven’t worn for ages and so on… Act now – there is never a perfect moment. The good news is that you can take the time go get rid of things. Fumio Sasaki took a year to get rid of most of his possessions. Now he owns: two identical white shirts, three grey sweaters, tow pair of jeans, a leather jacket, an overcoat, an anorak, four sets of underpants, socks and t-shirts as well as a cupboard of kitchen basic stuff, MacBook Air, an iPhone, a Kindle, a few bags and suitcases and a few other things and a scanner – a top tool for minimalists (you can digitise all your books and paperwork and remember most of the things can be replaced so don’t be intimidated by the ‘fear of regret’). More and more people are catching danshari or ‘get-rid-of-everything’ disease which may be an ultimate cure for the modern disease of ‘excess’ and consumerism. But if you like clutter and mess – don’t worry – read my blog about the benefits of clutter and mess.